Funds from Measure Z, Measure O's predecessor, are helping to build the Orleans Volunteer Fire Department's new station. While it's always the candidates that generate the most buzz, there's a lot at stake in Humboldt County on Nov. 6 beyond who ultimately ends up taking seats on city councils and the harbor district. A total of eight local ballot measures will decide tens of millions of dollars of local funding decades into the future. There are school bonds in Cutten and the Northern Humboldt Unified High School District, a hotel tax in Blue Lake and a sales tax up for renewal in Rio Dell. But inarguably the most interesting measures on the November ballot are the ones that will decide what should sit at the center of the Arcata Plaza, whether Humboldt should become a "sanctuary county" and if residents countywide should continue paying a half-cent sales tax that brings in about $12 million annually and has allowed the expansion of public safety services. No matter where you fall on these issues, remember that the deadline to register to vote in the Nov. 6 election is Oct. 22. While there are a variety of sales tax measures coming before voters next month — including the extension of a 1 percent sales tax that's allowed Rio Dell to balance its budget and a 0.25 percent transaction and use tax that, if approved by two-thirds of Eureka voters, will bring in a projected $2.2 million annually to help offset the city's $3 million annual road maintenance costs — none carries the countywide implications of Measure O. While proponents of Measure O are fond of saying it doesn't raise taxes, what it does is continue a fairly new tax. An extension of Measure Z, which passed with 57 percent of the vote in 2014, Measure O would essentially make the county's half-cent sales tax permanent unless voters put forward a measure to repeal it at some point in the future. County officials, including Sheriff William Honsal and District Attorney Maggie Fleming, have touted Measure O as a way to maintain essential public safety services throughout the county. And it's hard to argue that the roughly $12 million in annual funding from the sales tax hasn't had major impacts. At $12.89 million, revenue from Measure Z accounted for about 3 percent of the county's budget this fiscal year but nearly 15 percent of its "law and justice" spending. The funds are allocated annually by the Humboldt County Board of Supervisors based on the recommendations of an advisory board set up to accept and vet funding applications. The bulk of the county's Measure Z spending has gone to the sheriff's office, which took in $4.87 million in Measure Z revenue in this year's budget, with most of it going to pay salaries and wages for additional deputies. Honsal has touted how the funds have allowed his office to add additional patrols in the rural northern, southern and eastern stretches of the county, and to open and staff substations in Garberville, McKinleyville and Willow Creek. Revenue from the measure has also bolstered prosecutions in the Humboldt County District Attorney's Office, allowing it to unfreeze existing prosecutor and investigator positions and add one additional investigator and deputy district attorney. Additionally, the office has used a portion of its roughly $1 million annual allotment to pay for expert witnesses to testify at trial. 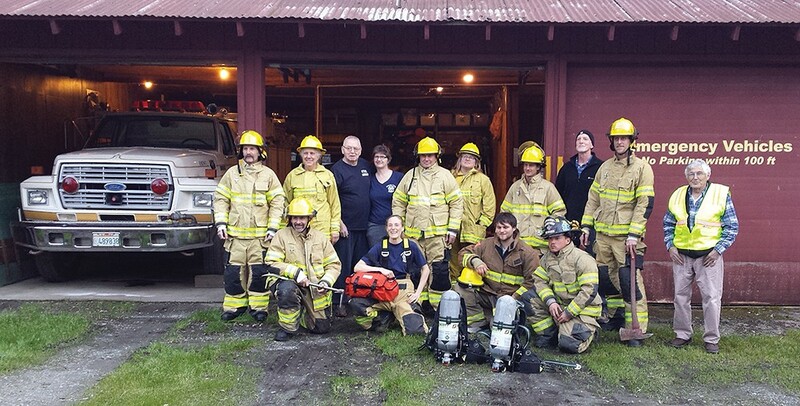 The county has also used the Measure Z funds to pave roads, provide infrastructure improvements for rural volunteer fire departments and provide mental health services. Overall, revenue from the tax measure pays the salaries of nearly 70 county employees. If Measure O fails at the polls, there's no doubt the county would have to reduce its workforce and curtail some services. While it's hard to argue that the added county revenue hasn't had a substantial impact, that doesn't mean it has been without criticism. During debates earlier this year for the county's Fourth District supervisorial race, some charged that Eureka — the county seat and home to many county services — hasn't gotten its fare share of funding. The Humboldt and Del Norte Labor Council has also raised concerns that the county's advisory committee leans heavily toward law enforcement and that it would like a more balanced committee that could take a more holistic view of public safety in the county. The labor council also noted that a sales tax is inherently regressive, meaning that because it is applied evenly to all spending it places a heavier burden on lower wage earners. (At 0.5 percent, the tax adds 50 cents to your bill for every $100 in taxable purchases.) All that said, the labor council endorsed Measure O. "We are opposed to regressive taxation and its effects on the least fortunate and underemployed. However, we also understand the immediate and substantial impacts to essential services that the citizens of the county at-large would face if Measure O is not passed," said labor council President Mike Hetticher in a statement. "We are committed in the interim to working toward an eventual replacement for this essential funding that will not impact those who can afford it the least." While there seems to be broad support for Measure O, it's also worth noting that it's coming before county voters as there's a growing amount of anecdotal evidence that the local economy is contracting, adapting to widespread changes in both the legal and illicit cannabis industries. And that probably has a lot to do with why proponents of the measure are constantly reminding voters that it is not a "new tax" and won't "raise" their taxes. It's also probably why one of the measure's slogans is, "We're all in this together." Voters will ultimately decide whether that's the case Nov. 6. There may not be a more polarizing item on your November ballot than Measure K, the countywide "sanctuary initiative" that seeks to restrict how and to what extent county officials can work with U.S. Immigration and Customs Enforcement. The initiative collected 4,315 valid signatures, easily surpassing the 3,715 needed to qualify for the ballot, and proponents maintain it is essential to protecting local immigrants and their families and will consequently enhance public safety and community welfare. Others, however, worry about the costs and charge that it is redundant, as California has already become a sanctuary state. The Humboldt County Board of Supervisors recently released a report estimating that implementation of the measure could cost anywhere from $171,500 to $312,650, with the vast majority of the spending — between $85,000 and $130,000 — coming from the sheriff's office to fund additional staff to meet reporting requirements of the initiative. Those estimates are simply outlandish, according to Eric Kirk, a local attorney and supporter of Measure K.
"The biggest figure by far is the one put forth by the sheriff's department," he said. "There's no way that Measure K would lead to that much work. The only thing that Measure K requires of the sheriff's office is track and report their own communications back and forth, to and from, ICE." Kirk said the aforementioned reports would only be required twice annually, in January and July. He also notes that the probation department would meet the same reporting requirement and that its cost estimates are far less, ranging from $1,250 to $2,500. The Humboldt County Department of Health and Human Services, meanwhile, estimates its costs between $34,000 and $46,000. County spokesperson Sean Quincey said the costs depend on the actions that the county would take to ensure proper training, possible employee discipline and, to a lesser extent, the number of instances per year where the county would work with with immigrant communities. "It's tough to estimate the costs of implementing any new law, especially when there is very little in the way of other examples to model an approach, and the county has to be careful where it spends limited resources. Staff is currently looking again at these estimates and hopes to bring forward a new minimal cost model soon," Quincey said, adding that the county will allocate the necessary resources to implement Measure K if it passes. The Asian Law Caucus, a nonprofit legal aid and immigrant rights organization based in San Francisco, did an analysis on Measure K at the request of its proponents and found its passage would require between no and minimal additional expenses. The caucus' analysis states that the county's estimates failed to take into account that Measure K's reporting requirements in almost every provision referenced by the county are already required under existing state laws. The semi-annual reports, informing county employees of the new law and documenting the welfare of the children of deported parents, do not require any additional costs, according to the caucus' analysis. The minimal expenses would include making transmit copies for county officials. Sheriff William Honsal, however, believes the county's cost projections are accurate. Honsal says the measure is unnecessary since his officers and other local law enforcement already follow state sanctuary laws like Senate Bill 54, The California Values Act, which prohibits state and local law enforcement from using money or personnel to investigate, interrogate, detain, detect or arrest people for immigration enforcement purposes. There are exceptions to the law, however, if a person is or was convicted of a dangerous, violent or serious crime within the last 15 years. "This measure is just not necessary," Honsal said. "Anyone who looks at our policy and procedure and sees how extensive it is, will see how we're following the letter of the law. We are not about disrupting the community. We're just enforcing state law." Resources in the sheriff's office are already tight, Honsal said, and he worries about the training requirements of Measure K.
"We don't have enough deputies out in this 4,000-square-mile county that we have," he continued. "So anytime we're taking the deputies off the street and training them here at main station for this, it takes them out of their jurisdiction." The sheriff's office rarely communicates with ICE agents as it is, according to Honsal, usually only during a very serious criminal case that could involve drug busts or human trafficking. Under the sheriff's office policy for immigration violations, employees cannot collaborate with ICE agents to look into a person's immigration status or detain a person based upon a federal immigration hold request. They also cannot provide personal information, like a person's home or work address, unless certain circumstances are met. But Honsal also said Measure K will not prevent ICE agents from gaining intel. "Despite the fact that there's a sanctuary bill or county, ICE will still be here," he said. "They can still come. There's no restrictions on them coming here. They can restrict my information sharing with ICE, but arrest data is public information. ICE doesn't have to disclose to any arresting agency who they are." County databases and local online publications regularly publish crime reports and inmate releases, which can be viewed by the public, including ICE agents. Honsal said it would be safer if local law enforcement dealt with ICE agents for serious crimes while suspects are in custody rather than leaving federal agents to track them down after they are released. "If they don't get them at the jail, then they're going to go back to where these people are living," Honsal said. "Then ICE will be here, in our community, going door to door and looking for this individual. And ICE suddenly doesn't become discretionary. Everyone that's undocumented gets detained and possibly goes through deportation hearings." However, local grassroots group Centro del Pueblo disagrees with the sheriff's assessment. Renee Saucedo, a steering committee member of Centro del Pueblo, spoke at a recent press conference where she refuted the estimated costs and strain on local resources. "We believe that this information is inaccurate and misleading," Saucedo said. "Measure K does not require the sheriff to do significantly more than what he already has to do under state law." She also concluded that by not assisting ICE agents the sheriff's office would actually save money. "By discontinuing the sharing of release dates to ICE, the sheriff will have no communications with ICE to report under Measure K," Saucedo said, encouraging people to seek out Centro del Pueblo and the Campaign to Pass Measure K for further information. "We will gladly provide this information. Since we wrote the initiative, we know it best." Saucedo shared concerns about the county's analysis with local faith leaders and community members on the steps of the county courthouse in Eureka. After several speakers, the conference ended with people shouting "Yes on K," as nearby cars honked in solidarity. Kirk, who worked with advocates like Saucedo to draft the initiative, says there are, in fact, key differences between Measure K and existing state law, including that Measure K does not have the same exemptions for criminal convictions within the last 15 years that are included in the state law. Measure K also gives undocumented immigrants more rights in determining who will take care of their children if they are deported, Kirk pointed out. While Senate Bill 54 and The California Trust Act provide certain protections for immigrants, Kirk argued that they don't go far enough. He says making Humboldt a sanctuary county ensures that people will stay protected even if California's state laws are overturned in the future. "We want to have a measure which stands alone regardless of the fate of S.B. 54," he said. "If the Legislature ever changes in political terms, we want to have something that is unique to Humboldt County. The sheriff isn't interested in any extensive joint task force involvement with ICE and that's great. But what about the next sheriff or the sheriff after that? We want a policy that we know, that this cooperation (with ICE), beyond what is the legal minimum, is not going to happen." 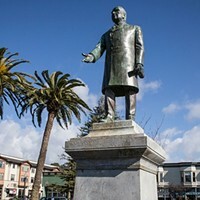 The statue of President William McKinley has stood center stage at the confluence of eight pathways in the Arcata Plaza for more than a century. 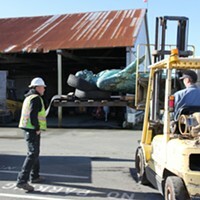 Whether the monument will remain is a question now before city voters in the form of Measure M.
Brought forward via the citizen initiative process in response to the Arcata City Council's controversial February decision to remove the bronze statue, the measure — if passed — would prohibit the "modification, destruction, relocation from the historic place in the center of the Arcata Plaza of the President William McKinley statue and/or its base." Proponents of the measure see it as a necessary stand to protect an American hero, while preventing the community from landing on a slippery slope. 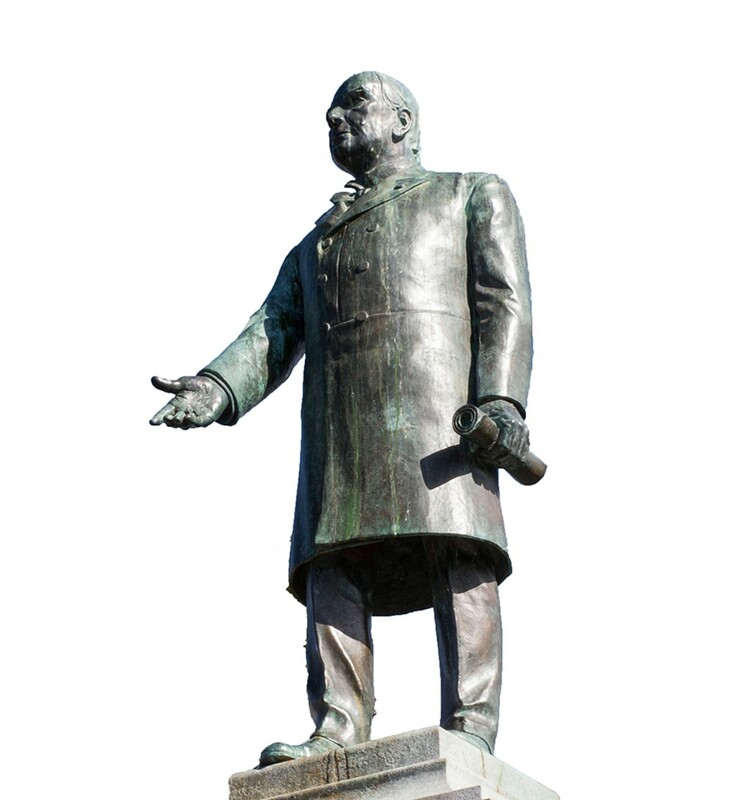 "The McKinley statue has stood watch over our plaza since July 4, 1906. President McKinley was highly honored in his time, both for his service in the Civil War and as an effective, progressive and enlightened leader," the ballot argument in favor of Measure M states. "Removing presidential statues is a dangerous path to start down. No president is safe. Rather than tearing down and erasing history, add to it and improve our understanding of its historic context." Both sides submitted arguments and rebuttals that will be included in the information packets sent out to voters. They are also currently available on the city's website, along with historical documents and other research materials. The November vote on McKinley comes as cities across the nation continue to grapple with how to confront painful chapters of the past represented by landmarks still standing in the present — from Civil War monuments in the South to San Francisco's recent decision to remove the "Early Days" statue, which was taken down last month. Commissioned a decade before Arcata farmer George Zehndner sought to commemorate McKinley's life following the president's 1901 assassination, the Early Days statue — which depicts a missionary and vaquero standing over a fallen Native American man — has long been decried as a racist commemoration of the brutal subjugation suffered by indigenous tribes. Similar arguments were made for removing McKinley's likeness from the plaza at a series of sometimes rancorous meetings that led to the council's Feb. 21 vote and remain central to the call to follow through with that decision. According to the argument against Measure M, McKinley "represents the belief in Manifest Destiny that was used to justify the dispossession, enslavement and genocide of the Indigenous Peoples of this continent and abroad. "The Arcata Plaza is the heart of our community where Indigenous Peoples and people of color are constantly reminded of the symbolism that the statue represents," the argument continues. "Vote for compassion, empathy, respect and dignity for the Indigenous community members and their relatives. Stand with Indigenous Peoples." The statue was dedicated amid much fanfare during a Fourth of July celebration in 1906 after the bronze — the first major work by renowned Armenian sculptor Haig Patigian — was brought to Humboldt County via steamship after surviving the devastating San Francisco earthquake that year. Zehndner paid $15,000 for his homage to the nation's 25th president, whom he revered, a sentiment apparently cemented after he reportedly met McKinley when the president visited San Jose shortly before his death. Research done by two city of Arcata interns found 1860 census data that shows Zehndner, himself a native of Bavaria, had indentured a Native American girl named Lucy, who was 7 at the time the information was recorded. According to the report by Humboldt State University seniors Steven Munoz and Paul Hilton, "Zehndner's history reflects him to be an opportunist who took advantage of the Indian indenture system in California." The systematic kidnapping, murder and trafficking of Native Americans during this period is documented in a 2014 paper titled, "'Unholy Traffic in Human Blood and Souls': Systems of California Indian Servitude Under U.S. Rule," by University of California at Los Angeles professor Benjamin Madley. His paper's title comes from the words of George M. Hanson, a Northern California Indian Affairs superintendent, who in 1861 wrote: "The fact is, kidnapping Indians has become quite a business of profit, and I have no doubt is at the foundation of the so-called Indian wars. To counteract this unholy traffic in human blood and souls, I have appointed a number of special agents in the country through which the kidnappers pass." Despite efforts by Hanson and some others the practice continued unabated for years and Madley's paper contains detailed accounts from the time that relay the conditions endured by Native Americans across the state. While McKinley entered office in 1897, about 30 years after Madley states the first steps began to dismantle the system — although it remained for an indeterminate amount of time — those in favor of taking down the statue point to similar actions committed in Puerto Rico, Cuba, Guam, the Philippine Islands and Hawai'i as a result of his policies. "Removing the McKinley statue from the plaza is not erasing history, it is viewing history through the lens of time and represents an evolution of our understanding of how and to whom we pay homage," the rebuttal to the pro-Measure M argument states. "Regardless of individual opinions about McKinley as a president, he does not define nor symbolize who we are as a community and had no local connections to this area." 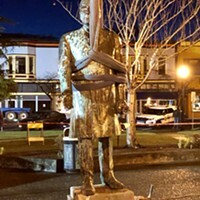 But those in favor of keeping the Arcata statue say the exact opposite is true, often pointing to his record as a Civil War hero, with the rebuttal to the argument against Measure M stating that "a shrill group has viciously attacked one of Arcata's crown jewels: our plaza statue of President William McKinley." "They hope to rewrite history by smearing a much-loved abolitionist president as 'racist,'" their rebuttal continues. Concerns were also raised about the potential removal costs in the ballot arguments for Measure M and the rebuttal to the argument against Measure M, estimating the number could reach upwards of $500,000, based on the experiences in cities like Charlottesville and New Orleans. Meanwhile the city is continuing to move forward with the environmental review process needed to remove the statue based on the council's decision — a process triggered because the statue is listed as a historic feature of the plaza in the Arcata General Plan. A draft Environmental Impact report is currently available for review on the city's website, with comments due by Nov. 5 — one day before voters will decide McKinley's fate. If Measure M passes, only another ballot initiative could reverse the decision. If the measure fails at the ballot box, the city will finalize the environmental review process and move forward with the relocation of the statue.